One mile south of N.H. Route 10, two miles south of Orford Village on River Road in Lyme. The structure spans Clay Brook. The bridge is 132'0" long with a clear span of 111'2". It has an overall width of 21'3" with a roadway width of 16'3" and a maximum vertical clearance of 12'7". The bridge is posted for six tons. The bridge was built by Walter Piper when he was only eighteen years old. It was assembled on the town common and moved by oxcart to the planned location. In 1936, it washed off its northern abutment. It was moved back, and tied down with cables. State bridge maintenance crews repaired the abutments, put in a new floor, and trued up the structure in 1971 at a cost of $23,829. On the night of February 21, 1982 the roof collapsed from a heavy load of snow. In July 1982, it was repaired at a cost of $30,000. 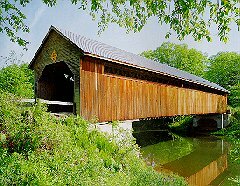 The Edgell Bridge is considered eligible for listing on the National Register of Historic Places.